Edgar Schein and the subject of organizational culture are forever linked due to his pioneering efforts in the field. His hallmark book, Organizational Culture and Leadership, has been a resource for more than 30 years. 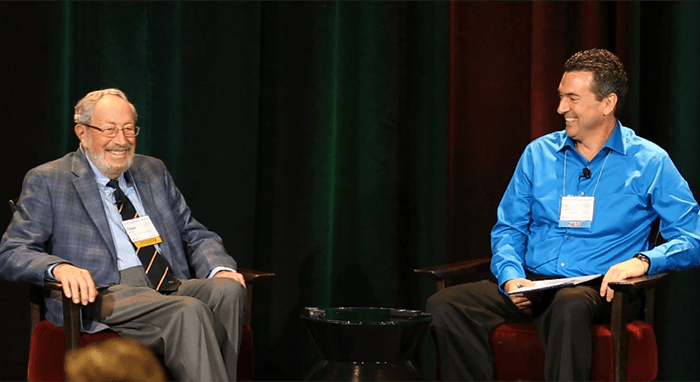 Ed shared insights from its recently released fifth edition during an interview at the Human Synergistics Ultimate Culture Conference last fall. Ed explained his original motivation for the book came from things he encountered as a consultant. He shared an important example as he contrasted his work with (the now defunct) Digital Equipment Corporation (DEC) and Ciba-Geigy. DEC didn’t want him telling them how to be better at something; they wanted process help. Ciba-Geigy (now Novartis) was “the opposite”— they wanted expert advice. He wondered what was going on in these organizations. Ed explained, “We say, for example, we want a team-based organization. If you suggest to a US company that maybe, in that case, you ought to change the reward system to be team based… and make groups accountable, you get kind of a frozen look from your client. “I began to realize toward the end of the fourth edition that we’ve got to become more international, and really look at the DNA that’s embedded in the country value systems and country assumptions about how things should be. “You can’t produce changes if you don’t have a relationship with your client. Lo and behold, you discover that every society discriminates around different kinds of relationships. At one level, we have a transactional relationship: professional distance, role-related, and bureaucratic. Ed believes you need to decide if “you are going to treat the other individual as a total human being or just as a representative of a role.” Ed identified the transactional relationship as “Level One” and the personal relationship as “Level Two.” He argues that “one of the reasons we don’t get anywhere in our change efforts is because we’re staying at that Level One relationship.” He feel s we should be concerned about why they want a particular change and what’s worrying them. “I’m almost tempted, when I get into a client situation or a coaching situation, to say: ‘Let’s have this entire conversation without using the word culture’. Let’s see where that gets us. It forces us to be specific. “If you really are dealing with a cultural variable, like the degree to which it’s constructive, you really have to start with the CEO. You cannot change culture in the middle. Over and over again we’ve seen very effective changes in the middle or at the bottom; a new CEO comes in and says ‘What’s all this’ and changes everything overnight. That happens all the time. Therefore, if culture is really involved, the culture piece is owned by the CEO, whether he or she admits it or not. “But don’t try to do this on your own, because you’re too vulnerable. It may work for a while, but the CEO, and the executive suite, and the board have all the power in the world to change things overnight and undo all the good work that you may have done.